Outdoor Relaxation at its Finest! The best part about staying in a beach house is being able to enjoy the ocean breeze from your deck… luckily this charming home is All Decked Out! Choose your perfect tanning spot from the huge decks that wrap around 3-sides of two different levels of this gorgeous home with a winding staircase that will take you from the ground-floor to the top level. As a bonus, the top-level deck climbs to a Widow’s Walk to give you a great view of the Atlantic Ocean! When you’re ready to actually go out on the sand, the lifeguarded Bonnet Street Beach Access is a short 3-minute drive away. Not only does the access have paved parking, but it also features a wheelchair ramp over the dune, a bath house, volleyball net and picnic tables. To keep you dry when loading or unloading your car, pull in to the enclosed 1-car garage. Entry to the home is on the ground-level through a foyer. Your fun in the sun starts outside in the Private Pool… BRAND NEW FOR THE 2019 SEASON! Lounge on your favorite float or do some laps before rinsing off in the outdoor shower. While the kids splash around, you can grill up some burgers and hotdogs for dinner on the outdoor grill. All the bedrooms are located on the middle floor of this home. A cozy Queen Master Suite features a private Full-Bathroom and direct access to the mid-level deck. Two more Queen Bedrooms are the perfect place to unwind with your Kindle at the end of an action-packed day. Down the hall, the kids will enjoy staying in a bedroom with 2 Twin Beds. These three rooms share a Full-Sized Hall Bathroom. The Laundry area is located on the landing between the ground-level and this floor. With plenty of big windows and natural sunlight, your family will love gathering together each day to watch TV or play a game of cards in the open-style Living Area. If you’ve picked up some fresh fish at the seafood market, the large Kitchen is stocked with everything you need to master your recipe. Enjoy a quick snack at the kitchen bar or organize a big family dinner around the dining table with room for eight. For the best views, take your meal out to the separate sun-room dining area. A Half-Bathroom finishes this floor. 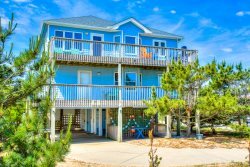 Conveniently located in Nags Head, All Decked Out is closed to plenty of local attractions, great shopping centers and awesome dining options. In fact, Jockey’s Ridge (the tallest living sand dune on the East Coast) is practically in your back yard! Hike through the self-guided trails and up to the top of the dune for incredible 360-degree views of the Outer Banks or try a hang guiding lesson from Kitty Hawk Kites. If you need a fun place to take the kids, head right down the street to the playground at Dowdy Park or putt a round of mini-golf at Galaxy Golf. At lunch time, Waverider’s Coffee & Deli is less than a half-mile away from your home and offers a great selection of build-your-own deli sandwiches and tasty pressed paninis. For a fresh seafood dinner, head across the bypass to Tortuga’s Lie – once visited by Guy Fieri on Diners, Drive-Ins and Dives – where you can order fish taco platters, a crab cake sandwich or something from the steamer. Whether you plan to lounge on the deck all day or try a fun, local activity, your perfect vacation destination can be found at All Decked Out! Mid-Level: Master Queen Suite w/ Full Bathroom & Deck Access, Queen Bedroom, Queen Bedroom, Bedroom w/ 2 Twin Beds, Full-Sized Hall Bathroom, Laundry Room, 3-sided Wrap Around Deck, Separate Seating Deck area? ?